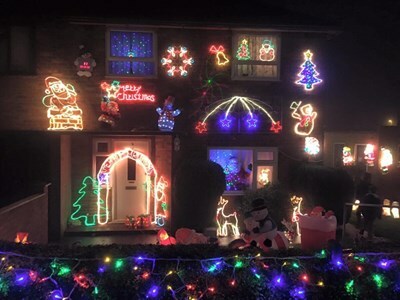 Telford & Wrekin Borough Councillor, Richard Overton has been putting on a spectacular Christmas lights show for local residents for over 20 years, with each year seeing new and more exciting lights on his house in St Georges, Telford. Last year, after a suggestion from the local barber, Cllr Overton has been using the display to raise money for Hope House, a Shropshire based childrens hospice and raised over £300 for this great cause. The Christmas lights have built up over the years and now consist of over 1,500 bulbs and 50 individual features on the house in Grove Estate, St Georges, TF2 9JH.